But needed lots of repairs before I could install this top-end audio system. Repaired and put back to original spec. a lot of the interior. Wiring was also very badly tampered with. Serviced all 4 doors and re-trimmed door cards. AVI XL-160 set for the front doors. Nakamichi CD-700 reference Nakamichi CD player-tuner in-dash. 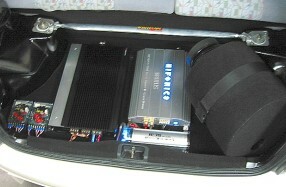 Nakamichi and Hifonics amplification and a custom, vented, Nakamichi SPW-10 subwoofer bass tube. Huge clean sound for a small cabin.